Report to the location listed in the course catalog. If TBA is listed, please report to the main office at the school to find out which room your class is scheduled to meet. Occasionally due to unforeseen circumstances, (snow, power outages, instructor illness, etc.) a scheduled class must be cancelled. Cancelled classes are always made up (same day of the week and time) by extending the finish date of the course, unless other arrangements are made between the instructor and the class.When day school is cancelled due to snow conditions or other weather or emergency events, evening classes are also cancelled. Look for the Worcester Public Schools cancellation notice on the stations listed below. In the event day classes are not cancelled and the weather worsens, if a decision to cancel evening classes is made, it will be relayed to the following radio and television stations by 4:00 PM (if evening classes are going to be held as usual, there will be no notice): WBZ-TV, WBZ 1030AM, WCVB-TV, WRKO AM 680, FOX 25-TV, WSRS 96.1, WTAG AM 580, WTAG 94.9, and WXLO 104.5 FM. 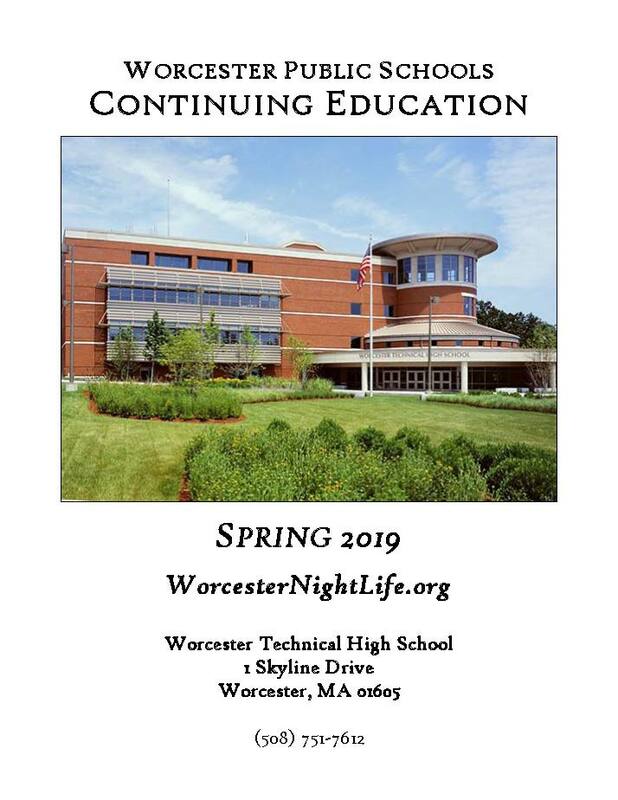 Night Life welcomes and admits students of any race, color, religion, handicap, national and ethnic origin and extends all the rights, privileges, programs, and activities generally accorded and made available to Continuing Education students. Children under the age of eighteen are permitted to register only with the express consent of the instructor. 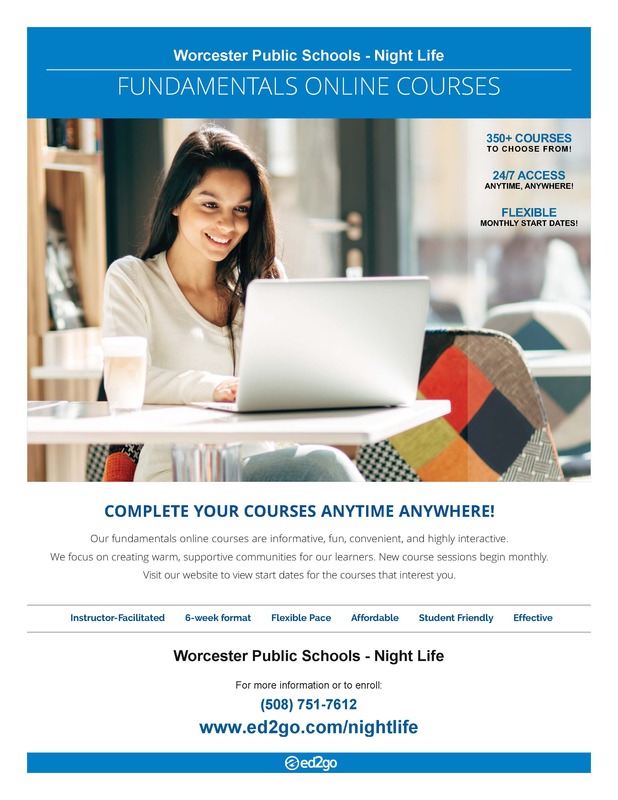 Unless otherwise specified, all Night Life courses are non-college credit, non-graded courses. Colleges and universities may upon their own discretion issue proficiency credit for course work taken through Night Life. 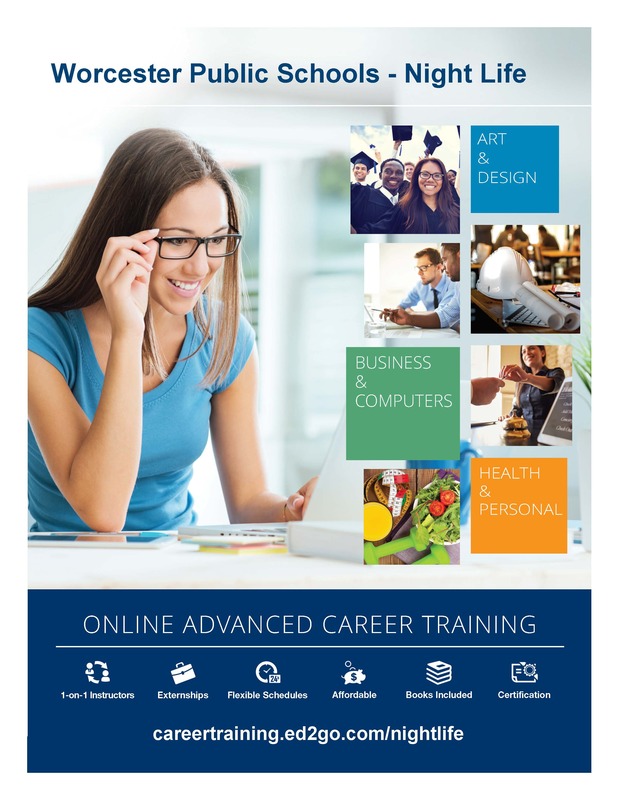 Certificates of proficiency and completion are issued to students enrolled in career training and professional development courses upon successful completion of a course or program. Adequate parking for students is provided in designated parking areas. The parking lots are well maintained and lit. Please do not park in front of shop doors or in the circular driveway. Worcester Public Schools are smoke free. This includes use of all tobacco products in school buildings and on school grounds. If a textbook is required for a class, it will be indicated in the course description. The book title, author, publisher, and ISBN number of the text can be found on our web page in the course description. After registering, students will need to order their text from an on-line bookstore (e.g. amazon.com) or from a local bookstore. Must be paid in full at time of registration. Payment may be mad by check, money order, MasterCard, or Visa. Night Life reserves the right to cancel classes with insufficient enrollment and to make changes in instructors or class schedules due to unforeseen circumstances. If we cancel a course due to insufficient enrollment, or if a course is filled when we receive your payment, you will be given a full refund. If you withdraw from a course at least 72 hours before the start date, you will receive a full tuition refund. Withdrawal less than 72 hours before first class, 100% credit memo. Withdrawal after the first class meets and before the second class meets: 75% credit memo only. No credit memos will be issued after the second class is held. Night Life will not hold classes on the following dates: April 15-19 (April break) and May 27 (Memorial Day).